SL Go By OnLive Now Accepts Linden Dollar Payments - KABALYERO - PLAY, BLOG & EARN! 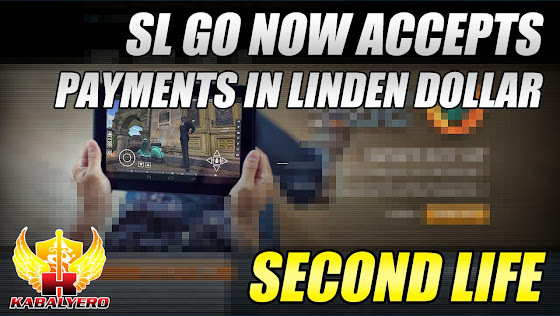 SL Go by OnLive now accepts Linden Dollars as payment for its Second Life streaming service. SL Go is a service provided by OnLive that will let you play Second Life anywhere and in almost any device. It does this by streaming the game to you from its cloud-based servers. With SL Go, you'll be able to enjoy Second Life in ULTRA Graphics setting with speeds of over 50 frames per second. Sounds awesome? Yes, it is. Even if you don't have a top of the line gaming PC, you'll still be able to enjoy Second Life in all its beautiful glory through SL Go. Unfortunately, SL Go is not FREE. An unlimited access to SL Go will cost you about 10 US dollars monthly but, the good news is, SL Go is now accepting Linden Dollars as payment. It will cost 650 Linden Dollars weekly for unlimited access to SL Go. Now, if this is something that interests you then you can create your free SL Go account in-world in Second Life. Of course, if you want to pay with real cash instead, then you can do that in SL Go's official website. The link is in the description of the video below or you just click here.